I filled up our backyard feeder with sunflower seeds to help out the birds when it is so windy and cold. They came within minutes, and I took the following shots of two of our regular fall visitors. House Finch looking up at bird feeder. Lovely photos! What lens were you shooting with? Blue jays are so beautiful; I’m glad you appreciate them – and I’m not at all surprised because I know you look at the world with fresh eyes. Too many locals don’t appreciate Blue jays. I had a friend from Germany when I lived in NYC who was absolutely thrilled when one came to a rooftop near his apartment. He thought he had seen the most exotic bird ever. 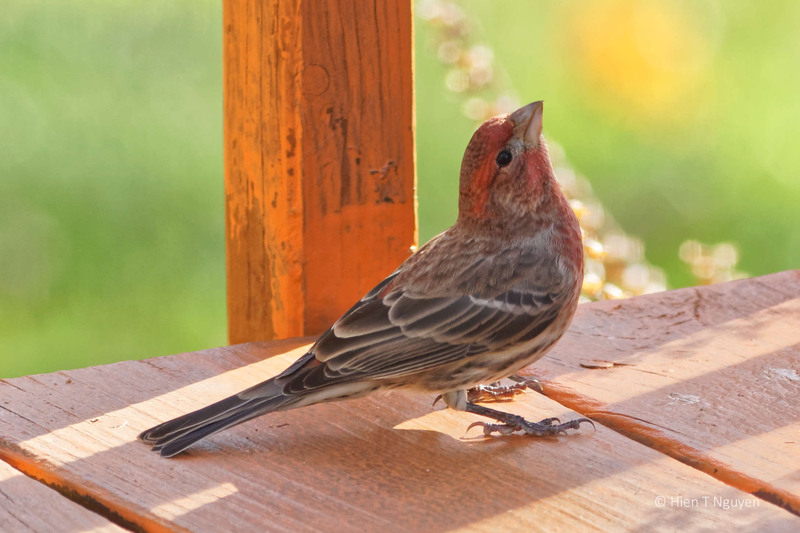 Have you noticed variation in the House finch’s plumage colors, or in their songs? I think House Finch colors, especially those of the males, are much brighter in the Spring, and more subdued now and through the Winter. 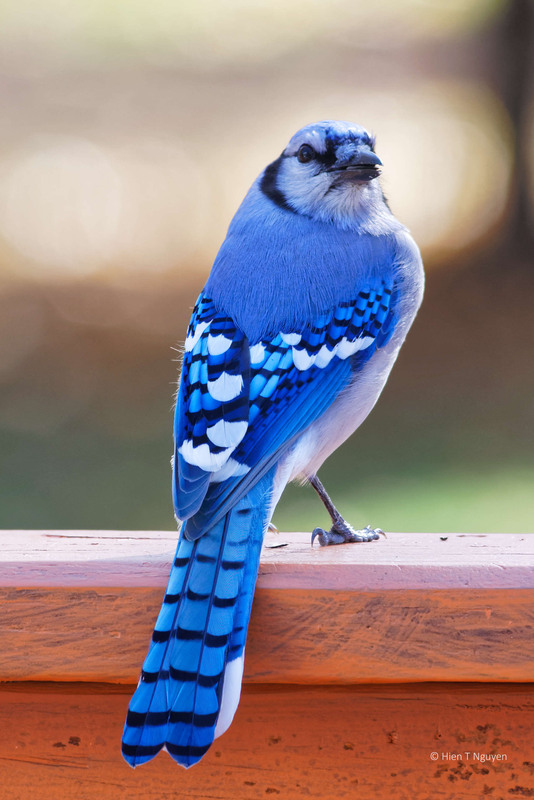 Blue Jays don’t appear to change their colors much throughout the year. 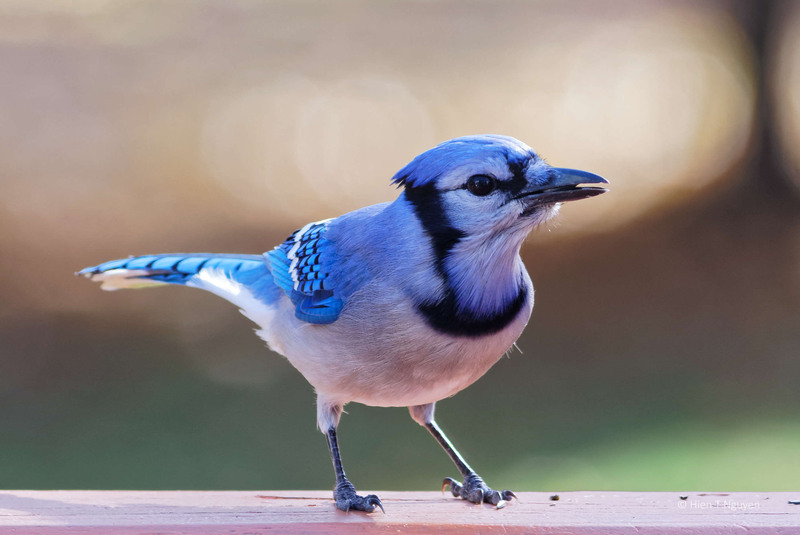 Blue jays always seem to look the same, don’t they? 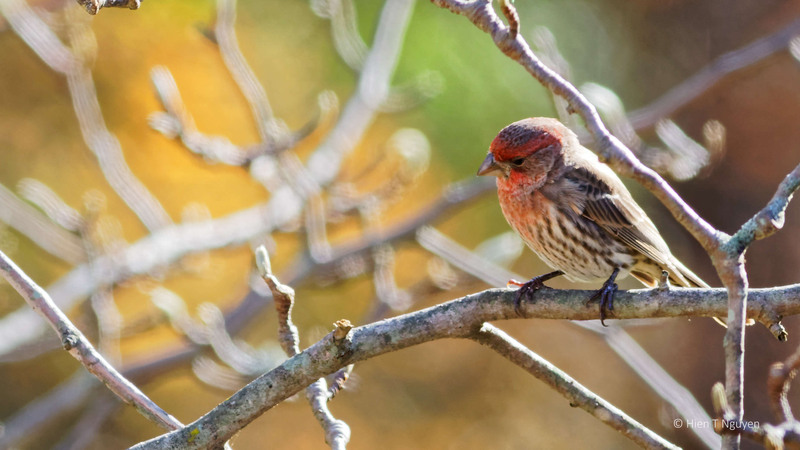 We used to have a few House finches when I lived in NJ that even in Spring, had a yellower cast to the red wash on the head, and I read that with this species, diet easily affects feather color. Something to look for. House finches are around this area, but very spotty, and never at my feeders so I really don’t see them like I used to. blue jays are canny bunch…we love having them. Create natural photos…. So beautiful Hien! I just love your photography! Am I allowed to reblog? Sure! No problem at all. The photos are very good overall, but once again, I’m struck by the color rendition that you’re getting. So vivid and true to life. Thank you Jerry! I took these with my old 400 mm lens which has always been a good lens for color and sharpness. Nice shots. Blue Jays and House Finches are regulars at our feeders, also. Especially when half a dozen of them take turns at the bird feeder! It would be nice if we could all see the birds in all of our regions, but unfortunately we can’t. Photos are the next best thing to seeing them in real life, even more so than zoos or aviaries. Thank you for commenting, Takami! That Blue Jay is so beautiful! How fun to see all those birds visiting your yard. Is that the same blue jay in the first two photos? He looks like he puffed up to have a word with you, Hien. Such a beautiful bird. Thank you Lois. Same Blue Jay, I think. Two came, but I am pretty sure I photographed the same one several times. What stunning colors on that blue jay. Perfect catch light. Well done. No throw aways here. Ha, ha! These are easy shots I can take from our patio door, and the birds are used to seeing me now. That is nice to have that arrangement. You have a mutually beneficial arrangement. Do you have the birds put their claw prints on a modeling release to sign it? Amazing photos. Stunning birds, how lucky you are to have such wonderful visitors. Thank you very much. We have a wooded area in the back, inhabited by many birds and animals, such as Red foxes and deer.